How the Global Strategic Sourcing organization at Bristol-Myers Squibb plans to deliver its next billion in cost savings. “Supplier relationship management will become our battle cry for the next 5-10 years,” says Anthony Santiago, Vice President of Global Strategic Sourcing and Financial Shared Services. Agreat danger for top purchasing execs is that success breeds high expectations. Bank $250 million worth of savings one year and top brass will be looking for $300 million the next. Bristol-Myers Squibb has been sourcing strategically since 1996. Between 1996 and 2002, the company’s Global Strategic Sourcing (GSS) group delivered $1.6 billion worth of savings on a total corporate outlay that can approach $10 billion each year. 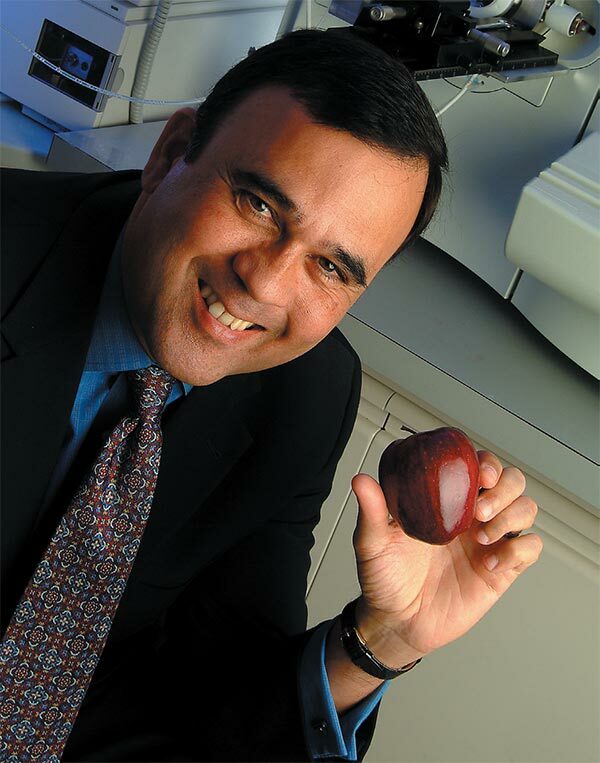 The group has leveraged—to a great extent— the company’s spending for such categories as chemicals; packaging and print; contract manufacturing; lab supplies, equipment and services; IT hardware, software, and professional services; facilities maintenance, repair and operations (MRO); creative services and advertising; market research; medical education; events; clinical trials; diagnostic services; telecommunications; consulting services; many human-resource related buys, and more. He says the group worked with a well-known management consulting company to develop a six-step sourcing methodology. “We found that we didn’t have the level of rigor that we needed in our sourcing process. In many cases, we were just placing orders rather than sourcing. The consulting company was very helpful with methodology. They also provided the human resources we needed to go through our initial waves of sourcing in order to prove there were benefits to pursuing leverage. As we built our business cases, we started using fewer consultants and hiring more people,” Santiago says. Kathleen Millsap is a good example of this. She is a microbiologist and was a bench scientist for Bristol-Myers Squibb before joining the productivity initiative that became Global Strategic Sourcing in 1996. “They loaned out scientists to support the productivity initiative because they wanted subject matter experts who knew what we needed from suppliers to be making the recommendations for which suppliers we would be using,” Millsap says. Millsap who was initially the category leader for sourcing laboratory supplies is now associate director in Global Strategic Sourcing, supporting the marketing and services categories. In years three and four of the group’s existence, Santiago notes that GSS hit somewhat of a plateau where annual savings diminished—from $252 million in 1997 to approximately $200 million in 1998 and 1999. This inspired the group to shift its focus to both “alignment and technology,” according to Santiago. To keep its savings trend sloping upward, GSS is implementing stricter purchasing policies and working with suppliers to identify process improvement opportunities. “Supplier relationship management will become our battle cry for the next five to ten years,” Santiago says. In the same way its purchase order policy went after an estimated $1.8 billion worth of nonproduction expenses that were bypassing the purchasing group each year, GSS at Bristol-Myers Squibb is now setting its sights on an estimated $1.6 billion worth of spending that, it feels, is coming to purchasing too late in the decision cycle to achieve maximum sourcing effectiveness. “Requiring purchase orders got us part of the way, but it didn’t get us early involvement,” Spak says. Timing is everything, however. “In a company of this size,” Santiago says, “you have to time big policy changes carefully. At Bristol-Myers Squibb, we had seen some significant growth over time. Then the economy turned for the worse, so we felt the time was right for a more stringent purchasing policy. This research helped Global Strategic Sourcing (GSS) to win executive support for a policy that requires all Bristol-Myers Squibb employees making expenditures to consult GSS personnel early in their spend decision processes. “One thing that we’ve talked about for many years is the idea that we’re going to run out of steam in terms of leverage,” Santiago remarks. “So we want to shift our focus to making processes better as opposed to making bad processes cheaper,” he says. 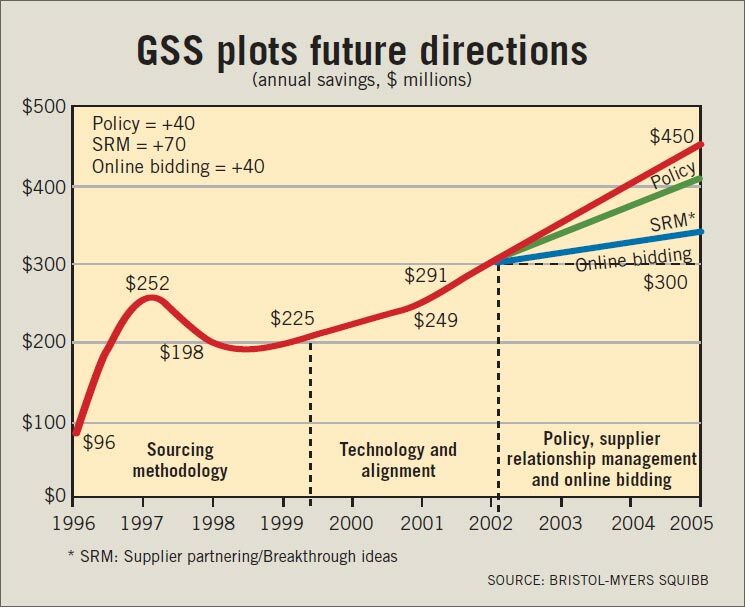 This thinking has given birth to an initiative that GSS has named, rather straightforwardly, supplier partnering. “We’re going to run out of steam in terms of leverage. So, we want to shift our focus to making processes better as opposed to making bad processes cheaper,” says Santiago. GSS actively recruits sponsorship from business unit stakeholders for workshop sessions with supplier partners. The sponsor sets a timeline for completion of workshops and idea generation. In advance of workshop sessions, GSS people interview both business unit stakeholders and supplier personnel for background on how the relationships work. They also survey suppliers targeted for workshop sessions (sample questions on page 30). GSS personnel facilitate one-day workshops comprising key personnel from the business unit stakeholders and suppliers. GSS asks suppliers to send executives and account managers but also to involve people who actually do the work of interacting with Bristol-Myers Squibb. The goal of the workshops is to identify significant opportunities for process improvements. Workshops include process mapping exercises followed by brainstorming sessions. Sponsors review lists of improvement ideas coming out of workshops and choose high opportunity ideas for implementation. Example: One of the suppliers chosen by Mitchell puts on very large meetings for Bristol-Myers Squibb to learn about new product launches. “We might fly in a couple thousand of our salespeople to talk about a new drug and how it will be used to treat patients,” Fawcett says. The supplier, in its workshop, noted that Bristol-Myers Squibb had no guidelines for when people should purchase their airline tickets to attend these events. “We looked at the data,” says Fawcett, “and found that more than half of the tickets were being purchased within three weeks of the events.” A simple followup guideline instructing sales personnel to purchase air tickets more than three weeks in advance of the events is expected to yield annual savings of $400K for Bristol-Myers Squibb, according to Fawcett. Another workshop conducted for the Primary Care Group occurred with a supplier that runs small educational meetings with physicians. In its workshop, the supplier noted that Bristol-Myers Squibb’s sales reps were renting, through the supplier, LCD projectors at a daily rental cost of about $500/day. (The machines can be purchased for around $2,000 each). “These were passthrough expenses for the supplier,” says Fawcett, “and they were being covered through T&E, which is why they weren’t showing up on our radar screens in GSS.” A follow-up survey on how frequently sales staff were renting LCD projectors led to a decision to purchase a machine for each sales office. Projected annual savings, according to Fawcett, are expected in the $1-$2 million range. “Now that the LCD projectors are owned, we expect them to be used more frequently, which will improve the value of our investments even further,” he adds. A benefit of having GSS coordinate the supplier-partnering program across Bristol-Myers Squibb is that it can leverage the ideas generated to all other business units as well, Fawcett notes. The long-term plan, according to Fawcett, is to follow these quick-hit workshops with more periodic supplier meetings and formal performance metrics. 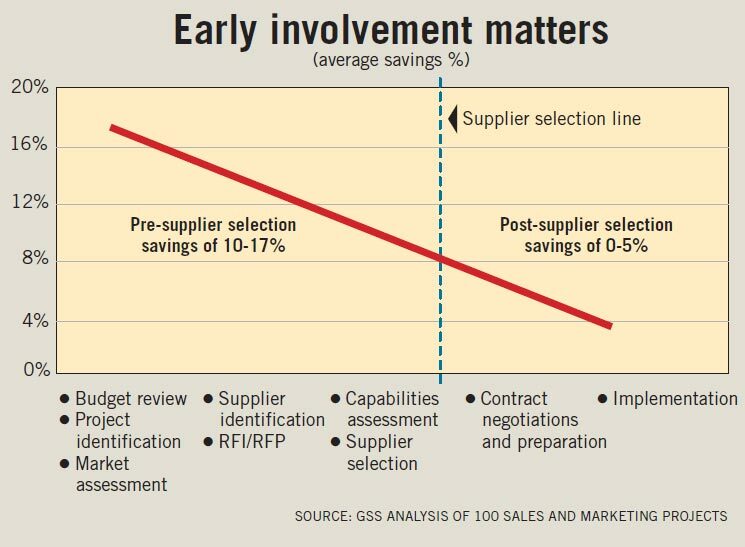 GSS also envisions suppliers extending similar process improvement exercises to their own supply chains. How does your interaction with BMS compare to your other customers? When you think of your best customer, what is it about that relationship that makes it superior to others? Think of a project or service work you performed for BMS that you feel went well. What happened that made it successful? Think of a project or service work you performed for BMS that you feel went poorly. What happened to make it unsuccessful? If you deal with more than one person at BMS, are your interactions consistent or standard from person to person? In other words, is there a standard process in the way you work with BMS or does it vary depending on whom in BMS you are working with? What does BMS do well? What does BMS not do well? What can BMS do differently to help you lower costs, improve service, or reduce cycle times? What do you not do well? What areas overall in the relationship do you think can be improved? While supplier partnering focuses on maybe 100-150 critical suppliers, comprising roughly half of Bristol-Myers Squibb’s annual spend, another program, still in its infancy, will extend the concept to a much larger portion of the strategic supply base—say 500 suppliers covering 80-85% of total spend. The idea actually came from an ongoing process benchmarking initiative in which GSS periodically invites reps from select supply management organizations to participate in focused two-day roundtable discussions. “We were impressed,” says Spak, “with another company’s program.” This program will be communicated to top suppliers at an annual conference. The top management team will take the opportunity to share business objectives with suppliers and clearly communicate expectations of working together to generate innovative costsavings measures. “We will support this with a Web-based technology interface for soliciting, evaluating, ranking, and acting upon ideas submitted by suppliers,” says Spak. goal structure in place for its suppliers, he notes that, through Business Warehouse, it already has the data infrastructure for creating one. “In the past, we have set our cost reduction goals by family of spend, but not by individual supplier,” Spak notes. 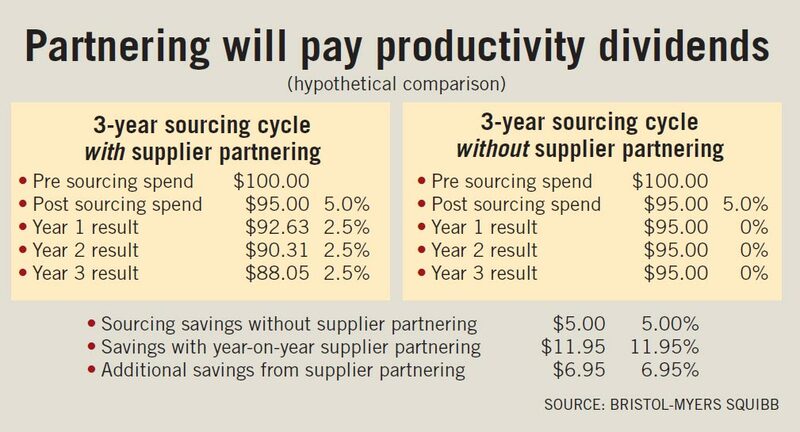 By actively soliciting improvement ideas from suppliers, the Global Strategic Sourcing group at Bristol-Myers Squibb thinks it can more than double its per-supplier savings over a three year period. According to Beatriz Loizillon, associate director of sourcing effectiveness for GSS, the group is evaluating software options, focusing on those that provide an ability to build evaluation criteria right into the submittal process. “The software we choose will assist with scoring of ideas according to criteria we set,” she says. The submittal form, she notes, will require suppliers to provide estimated returns on investment for their ideas. So far, Spak says the response has been positive, although he notes that some managers are worried about overloading the troops, especially with all the new sourcing work coming to Global Strategic Sourcing through the early involvement policy. With so many strategic initiatives underway, it’s no wonder that GSS managers are beginning to worry about spreading their resources too thinly. But, that’s where Frictionless Commerce comes in. Frictionless Commerce is an enterprise sourcing software application that will create a systems bridge between the GSS Business Warehouse—where spend data is first collected and organized— and the SAP, Ariba, and ECOutlook systems—where day-to-day purchasing transactions are executed. Frictionless, in effect, is the software GSS has chosen to automate and control its activities for advanced spend analytics, collaborative development and refinement of RFx specifications, market making—electronic RFx and “Express Proposals” (auctions)— plus negotiation and creation of strategic supply contracts. 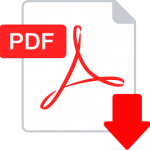 (Note: Documents pertaining to completed GSS contracts are managed in an information system driven by Documentum software). data cleanly from one step of the sourcing process to the next. A first step in the ideas program will be to set up a supplier goal structure for cost reduction, productivity improvement, quality improvement, or whatever else may be appropriate. Provide a procurement portal tailored to the specific interests and needs of GSS personnel and management. Santiago has mandated that, in order to receive credit for their work, GSS personnel must enter all sourcing savings projects into the Frictionless system (with greater detail required for all savings projects exceeding three person- weeks in duration). He also encourages GSS personnel to use the system wherever it meets their needs for project management on nonsavings projects they may be undertaking. System configuration and testing was completed in January. By the end of April, all GSS personnel will have undergone two full days of Frictionless training. An imminent upgrade to version 3.0 will add more functionality and expand use, according to Tuttle. Electronic auctions (“Express Proposals”) are a central part of the Frictionless implementation. For the auction piece, Tuttle notes that GSS has two people who are specialists in auctions. By Santiago’s reckoning, Express Proposals alone could generate up to $40 million in savings by 2005.